At the time of this review, the book holds a 5-star review on Amazon with 19 reviews. Book Obtained By: Purchased from the author after she presented at the Red Sneakers Writers Presents Write Well Sell Well Conference in Oklahoma over Labor Day weekend. “Twelve-year-old Alli Rosco is smart, resourceful, and totally incapable of keeping her mouth shut. When she escapes the miserable orphanage she has called home for the past nine years, she finally feels free. But Alli quickly learns that freedom comes at a price. After a run-in with one of the city’s protectors she is marked by a curse that’s slowly working its way to her heart. There is a cure, but the cost is astronomical. And the clock is ticking. Enter Beck, a boy who seems too good to be true. He tells Alli that the legendary Thieves Guild, long thought to be a myth, is real. Even better, Beck is a member and thinks she could be one too. All she has to do is pass the trial that the king of the Guild assigns to her, join the Guild, collect her yearly reward, and buy the cure. The Guild is her ticket to the cure, and it just might be the home—and the family—that Alli has always wanted. In Azeland, Alli Roscoe plots her escape from the orphanage. Once she’s free, the enormity of her life change hits her—she’s got nowhere to sleep, she’s got the clothes she’s wearing, and the shoes that mark her has out of place in any nice shop. Based on the book’s cover, and Ott’s descriptions, I pictured an arid climate and a marketplace-driven, non-industrialized society. Protectors keep law with brute force and magic. She must evade them because she’s a runaway, but that’s harder because a Protector hits her with a curse. “I add one more to the list: Don’t think about who the marks are. Looking at what they carry, not who they are, makes it easier to ignore the lurch in my stomach that might, maybe, be guilt. 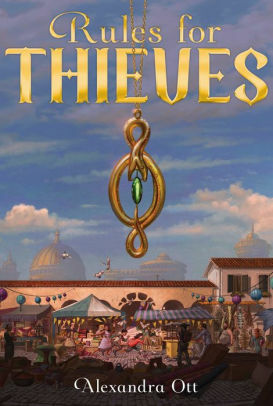 Ott keeps the pacing fast, whisking Alli and Beck through their friendship with one lesson in thieving, one escape after another, and the eventual reveal about the Guild and all it can offer her if she joins and accepts those hard rules Beck shares. At the Guild, Ott expands the cast of characters. It became harder for me to keep track of who was who as she unveiled first or last names, and quick snippets about the kids. The Guild’s location marks a huge contrast to Azeland, adding snow and a game that’ll make you worry for Alli. Through all of this, she’s learning more about being a thief and deepening her friendship with Beck. Stakes do rise, and it’s deliciously fun seeing the lengths Alli goes for her trial, needing disguises, and what she’ll do for friendship even if it breaks a Guild rule or two. I loved the flying creature Ott introduces as a mode of transportation, the giant thilastri. The story fell shy, when I couldn’t suspend my disbelief at the final stage of the trial. Past the time Alli figures something out, I was asking myself why anyone had let the trial get to that point. It’s still a set of exciting scenes, but my logical side called it a hole in the storytelling. Learn more about Alexandra Ott at her website. This entry was posted in Book Reviews, Uncategorized and tagged Alexandra Ott, amreading, Book Review, bookblogger, Fantasy, Middle Grade Fiction. Bookmark the permalink.